In the sixth century, the Emperor Justinian commanded that a monastery and church be built on the site where it is believed the burning bush was seen by Moses at the foot of Mt. Sinai. 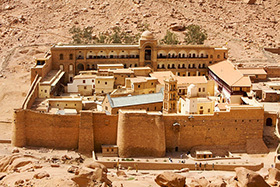 Construction took place between 548 and 565 CE, and now Saint Catherine’s Monastery is the oldest Christian monastery in the world still in use for its original function, predating most of the divisions of the Christian world. The monastery also houses what some consider to be the world’s oldest continuous library, containing a collection of early Christian codices, art, and manuscripts that is second only to the Vatican. Saint Catherine’s Monastery is one of the few ancient monasteries in the region to have never been destroyed during the rise and spread of Islam. The monastery’s tradition states they received a letter of protection from the Prophet Mohammed himself. Then, in the eleventh century, as pressure from the Muslim empire around it grew, a small mosque was built on the monastery’s grounds, a place where local Bedouin Arabs still pray. The monastery is currently run under the auspices of the Greek Orthodox Church.